who gets to visit the park ? .. For over 15 years a battle in the courts, on the streets, in the press, and in the halls of congress has raged. .. 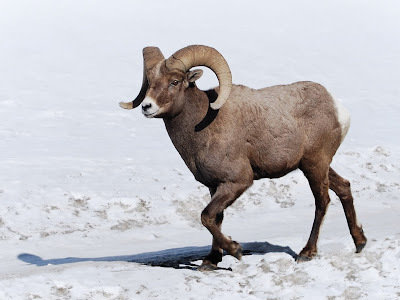 It has been contested by special interest groups of all stripes: bison interests, concession interests, snowmobile interests, park interests, environmentalists all! .. 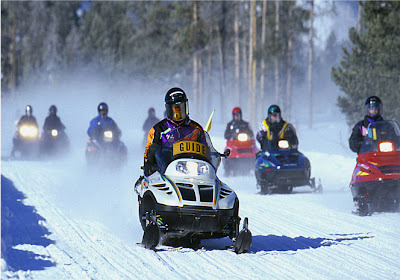 The tunnel vision of the many and diverse groups enjoined in the battle has pushed the discussion to the absurd notion that: "the number of snowmobiles that enter the park is a solution to winter access." .. This is a classic example of the Law of Unintended Consequences. Despite the wonderfully human hubristic notion that we can control the world around us, the audacity is overwhelming; and by pretending to do what's best for the park, the consequence is to reduce access to only those able to afford the skyrocketing prices for a visit. 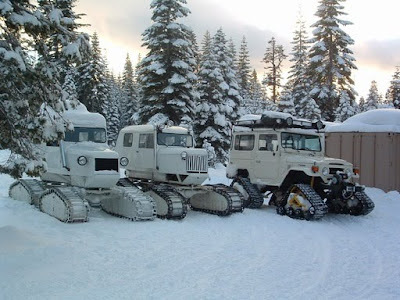 .. Not a single position paper, legal decision, or environmental argument has seriously addressed the sensible notion that a plowed road is the best access to Yellowstone National Park. .. 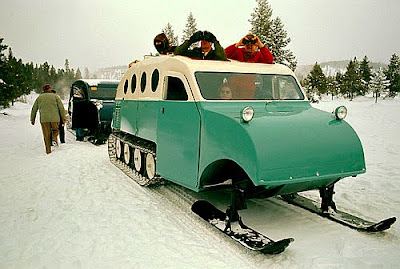 The current situation, in winter, is a consequence of assuming that over-the-snow travel is best. So now, fewer and fewer, richer and richer, visitors are 'allowed' in the park. 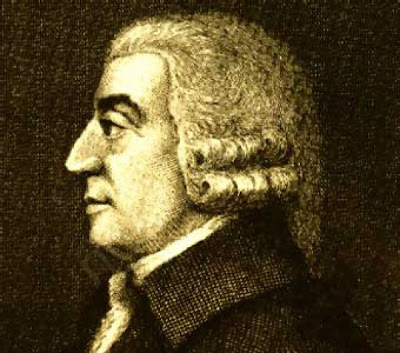 The invisible hand strikes again. .. Concessionaires love the affluent traveler. "Upscale" is a source of constant excitement in the shadowed rooms of hotel offices, tour companies, chambers of commerce, and merchants of gateway communities. .. Advocates of diesel belching buses on tracks are revolted by the term "elitist;" yet there it is. The park in winter is returning to it's railroad-driven roots. .. Bring the rich. Herd the rich to the right places. Tell them entertaining stories. 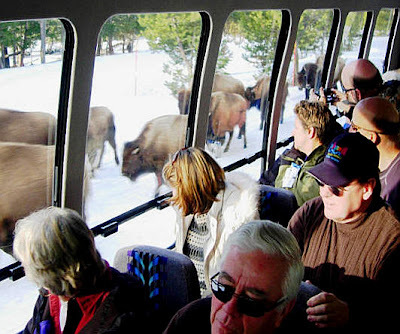 Take their money, send them away, and call it the "Yellowstone Experience." .. Today shepherds on sleds herd their flocks to "THE ATTRACTIONS" and work on a time schedule that leaves little time for personal exploration or just pausing to admire the wonders. Of course, maybe the rich enjoy being herded for a change. .. Bus drivers become 'guides' in a quick seminar where the NPS provides the current emphasis and stories for telling. .. 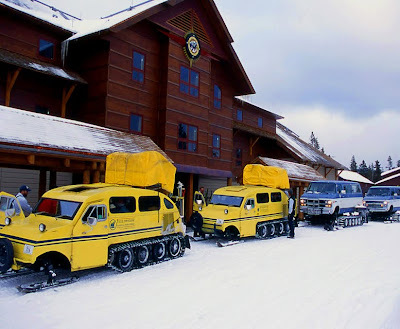 The rich are gulled into believing that traveling over the snow in a 60-year-old vehicle is part of the 'true' Yellowstone Experience. Certainly far better than driving your own car and enjoying the park with your own family. .. 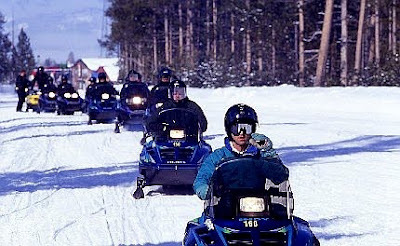 There is now a movement afoot to try to dissuade the National Park Service from it's predisposition toward over-the-snow travel. It's been whispered in this town for over 30 years. It's been spoken out loud for the last five or so years. .. 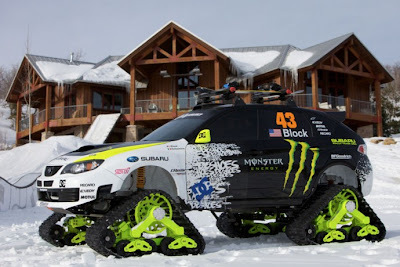 It has now reached a formal position in: PLOWYELLOWSTONE.org. Mostly, this is a West Yellowstone initiative, however it has adherents at the south & north entrances as well. .. And, as you know, the road from Mammoth to Silvergate is a year-round road. .. We suggest that you visit the website and read about the rationale behind this thought. 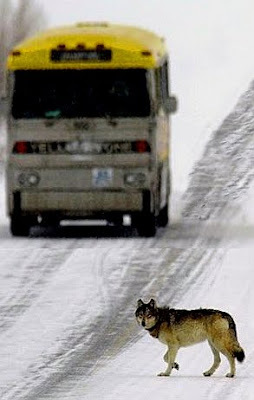 .. We know that many of our neighbors in Bozeman, Idaho Falls, Ennis, Pocatello, and Salt Lake City would enjoy a personal visit to Yellowstone without the mandatory imposition of an expensive "guided, over-the-snow, experience." .. At $100/day/person, (or more,) the current structure of park access certainly mitigates against large families of most economic stripes. It certainly discourages the not too affluent visitor with 3 children. .. 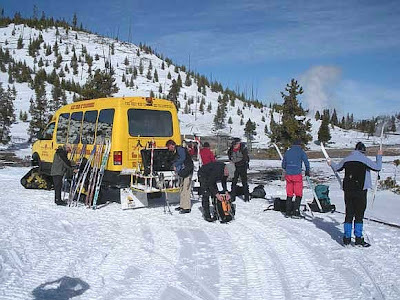 There is a public comment period for the next 30 days that will allow you to voice your opinion about the winter use plan in Yellowstone National Park. .. Too many people fail to use the opportunity because they have become jaded about the outcomes of the process. But as they say in Chicago: vote early and vote often. .. What has this to do with fly fishing in Yellowstone National Park? 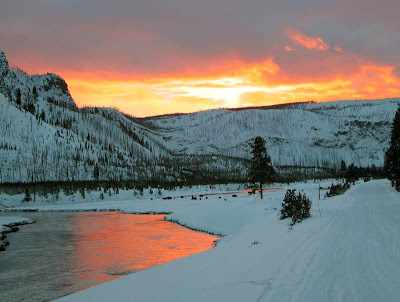 We've heard whispers from very influential people that the best way to preserve the fishing experience in Yellowstone is to increase the cost of the fishing permit, AND add a surcharge for each river, lake, or stream fished. .. 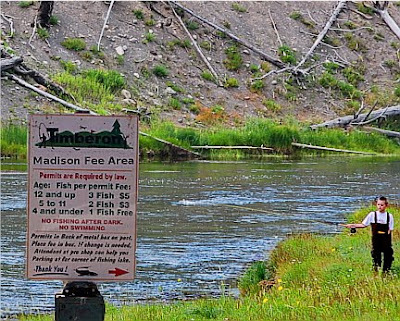 Certainly $100/day/stream/rod could be afforded by many affluent visitors that fish the park. "It's the upscale crowd that we want!" .. We'll keep you posted. .. Given the recently added access to $3 Dollar Bridge, it's not surprising that few fishers take the backdoor. But there's some good fishing to be had this time of year by walking the bank and picking your spot. .. Spot and stalk, (as hunters would say,) is a possibility, - BUT - there's few very dense hatches in terminal February. Fishing the seams and slick dark water is probably more productive right now. .. The Oliff Family has granted a 50' shoreline easement along the Madison River for access to this wonderful wading section of the river. This easement extends from the public access at the Raynolds Pass Can all the way to the $3 Dollar Bridge access. .. It's a backdoor worth taking! For us, bank fishing is becoming the norm, and there are many little slicks, debris hides, and 'sweet seams' that are not much more than a rod's-length distance from the shore. The willows provide some cover, especially with the sun low in the southern sky. .. We visited this locality twice over the weekend. Caught some good fish and didn't even get in the water. .. The sun was bright, the air was still, the snow is well packed and not deep. Both days were - dare we say it - Spring-like. .. We've become attached to small streamers, stone flies, soft hackles, and the Yellowstone Winter Grub this year. .. An occasional small caddis nymph has been used but our winter assortment this season has been small and productive. .. It's not that we lack competent waders, or that the cold water is a problem, nor is it a lack of manly stuff; rather it's the legs. ..They begin to wobble after a couple of hours and we'd rather fall in a pile of soft snow than a puddle of cold wet water. .. This locality is where the river begins to broaden out. The braided discharge channels from Quake Lake coalesce into the hundred mile riffle right here. Wading can provide access to some wonderful places. And the shoreline is probably not the preferred place. But there are fish to be had and the scenery is wonderful. .. The neighbors are pretty cagey folks. They know where and when to fish. They know how to get there, and usually don't say much about it. .. If you see two vehicles abandoned in an out-of-the-way area - near water - you better rig up. .. Of course three's a crowd in some areas. But not in others. The Madison River is still fishing very well at Raynolds Pass. .. The neighbors don't mind the drive in the winter. This winter it's about like summer driving. Even the access road is passable in two-wheel drive. .. Small streamers, buggy grubs, wet flies, and nymphs will fill your dance card even in mid day. .. The midges have slowed down just a bit, but the fish don't seem to mind. .. 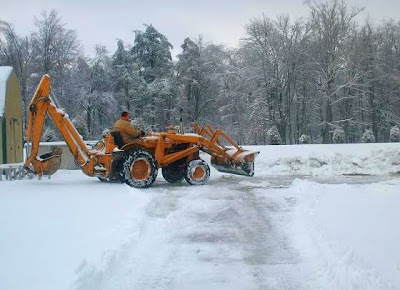 Although the days are warm, (to 40 degrees,) the nights are cold enough to keep a bit of snow on the ground. .. The trails to the river are well worn and the post-holes few, far between, and shallow at worst. .. The resident sheep are licking salt off the road and do not seem to mind posing for a portrait. Maybe we'll go back tomorrow. .. Finally got around to going fishing, but after a while we ran out of worms. On the lake shore was a cottonmouth snake with a frog in his mouth, and frogs are good bass bait. Knowing the snake couldn't bite with the frog in his mouth; we grabbed him right behind the head, took the frog and put it in the bait bucket. Now the dilemma was how to release the snake without getting bit. 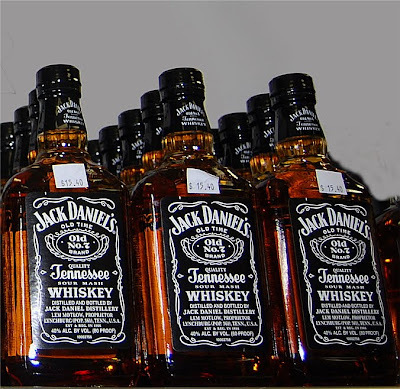 .. We grabbed the medicinal bottle of Jack Daniels and poured a little whiskey in its mouth. His eyes rolled back and he went limp. The snake was released into the lake without incident and we continued fishing with the frog. .. A little later, there was a nudge on our foot. There was that same damn snake with two frogs in his mouth. .. As promised, here's the third in our winter wallpaper series for this year. With the hardwired connection gone for another week or so the upload speed was horrendously slow. The files are giant. Enjoy them. .. We're experiencing the results of antique infrastructure. Poorly routed cables are negatively affected by "The Plumbers Winter" conditions. Very little snow cover and deep frost penetration have conspired to disable our normally superb Internet connection. It's going to take a backhoe to fix it. .. Our aged laptop is in excellent shape, the wireless connection works well - just slow. Uploads are painful and stuttering is common. Just 5 years ago we'd be thrilled with the performance; today it hurts. So be it. We can now empathize with the bookmakers in Vegas after a bad call on the big game. So be that too. .. Catching on the tailwater below Hebgen Dam and between the lakes has picked up with the continued warming weather. The cool nights have kept the experience from being insanely perfect; it's just pluperfect. So be it. .. Slow drifted nymphs are producing well in the afternoons. Dark water and light-dark seams are the places right now. Depth seems unimportant at the moment. .. The last couple of days have shown a bit of increased exuberance on the part of the fish. Larger fish are less lethargic and can be taken on the Yellowstone Winter Grub. .. A few of the neighbors have also ventured over the hill to the Madison River around Slide Inn. 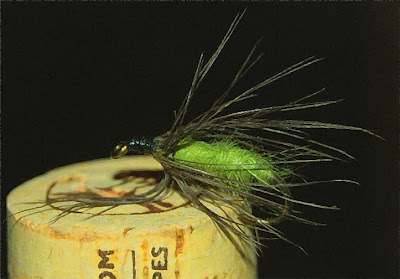 Small streamers and nymphs in bits of slick water near the banks can prove to be rewarding in the bright sun. .. 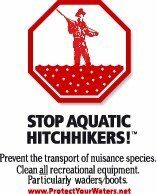 If the warm weather continues look for the catching to keep pace. 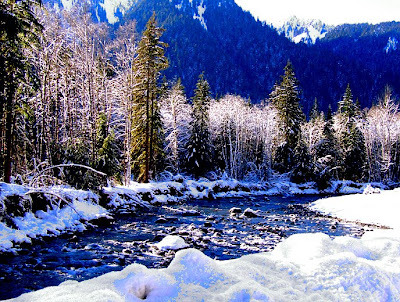 So far, the 'Winter' has been rather gentle and the snow-pack has been disappointing. It's so warm that bears have been seen in the Paradise Valley and near the Idaho border on our South Plateau. .. Speculation, though a bit premature, has the neighbors worrying about the possible catastrophic Spring runoff and a long low warm Summer. We'll wait a while before crying in our beer. .. A local pub, (Bullwinkle's West,) has installed a web cam and designated a "Cam Zone." 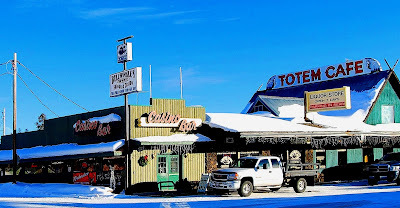 This is the first pub in West Yellowstone to follow a national trend with web cams. .. You can watch the party live. There will be many folks waving to the family back home. It's not as spectacular as the Old Faithful web cam, but it may be just as much fun. .. 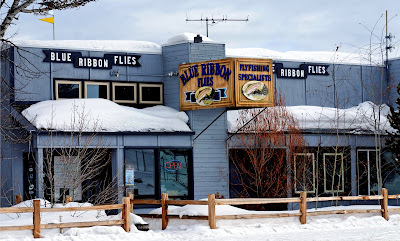 There's a fine index of useful web cams at Big Sky Fly Fishing. Jeez! And we thought we were the pig's squeal with a digital point and shoot. .. There are two ways to display this information on your computer. 1] if you're a computer mapping junkie, you can download the ".kmz" file and display it on your computer's copy of Google Earth, or --> 2] you can go to the NCRS site and view the daily image. .. The data base includes all NCRS SNOTEL sites for North America, and can be viewed either with, or without labels for the sites. .. There's nothing that we can do about the results of the weather, but now we can see and talk about it in real time. .. The data files are updated daily around 7:30 am and 12:30 afternoon Pacific Time with midnight summaries of the previous day’s data. The symbols are color-coded by the current snow water equivalent as percent of the 1971-2000 normal on this date. .. The ".kmz" file is recognized on your copy of Google Earth as "places." If you click on the site of interest you will get a photo of the site and a summary table for the data collected at that site. There are additional real-time reports included in the information on the photo page. .. There is also a Google based "Water Supply Forecast" data base created by the NCRS. This is displayed in the same way as the SNOTEL data and can be viewed both ways as well. The forecasts are based on the snowpack, and are available for drainage basins. .. Another pair of Google ".kmz" files has been prepared by NOAA. These are 3-D overlays of the snowpack analysis and snow reports. These are based on the latest, (usually daily,) NASA and NOHRSC imagery.